I have to tell you about the evening Mr. Lynch and I had on Friday. We’d both cleaned up inside Paddy Healy’s farmhouse when Paddy’s wife, Anne, came out from the kitchen and asked us what we would like for dinner: chicken or salmon. Whichever would be easiest for you to prepare, I said. Well, it’s no matter, said Anne. Salmon or chicken, it’s all the same. So we said salmon and not thirty minutes later she was at our caravan knocking on the door and telling us that supper was ready when we were. Dinner was in an odd little room with a lot of family memorabilia, including a mirror they’d been presented on one anniversary or another and some photos of the countryside. The meal was simple but tasty with various starches including, of course, lots of potatoes. But our choices for a beverage were limited. Water or juice, I think it was. Not that I blamed them. Why should they pour a glass of wine or even a pint for a couple of fellas sleeping in a caravan in their horse pasture? I certainly wouldn’t have. Still, I was a wee bit thirsty. And it was still light out. Since Paddy had mentioned when we arrived that he could run us up to the pub later if we wanted, I asked Anne if he was around. Why, she said, do you want to go to the pub? If it’s no trouble. Well, he’s out himself he is and probably won’t be back any time soon if I know my man so I’ll see if me daughter can run you up there. A few minutes later, her daughter, who looked to be about twenty or so, came out and said she was on her way out and she’d run us up to the pub. Now normally I’d have just walked to the pub but the thing is, you see, the pub was at the top of the long hill we’d gone down to get to Paddy Healy’s farm and the idea of having to hike a mile or more back up that grade—well, it just wasn’t something I was really keen about if you know what I mean. 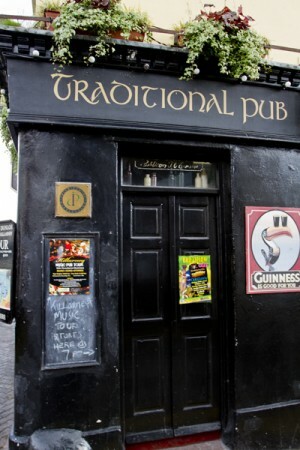 So in no time flat we were at the pub and Paddy Healy’s daughter was on her way to wherever the real craic was that night for when we walked inside there wasn’t another soul around. Not even the proprietor. I could hear some voices in a back room so I called out Excuse me and not long after that a middle-aged woman looking quite put out came to the bar. Could we get a pint? I asked her. She drew a couple of black ones as quickly as she could and then disappeared back into the room where she’d come from. Mr. Lynch craned his head around the corner and reported that she was back there sitting on a lounger with her feet up in the air watching some kind of Irish soap opera. Probably she’s a bit upset that we disturbed her TV viewing, says he. The pub was god awful. It was only a tiny little room with one wall of distressed chairs and a few photos and such on the wall recalling events that had happened in the pub years ago. We sat there and drank our pints, trying to think of something to say to cheer ourselves up but nothing came to mind. I kept looking at my watch to make sure that it really was a Friday night about eight in Ireland and we were in a pub that was as dead as a graveyard in Lourdes. We drank our pints and Mr. Lynch said, Do you think we should get another, and I said, Well, why not? We’re here after all. And he said, I just don’t want to disturb the woman if she’s watching her soaps. So I went to the bar and cleared my throat and said, Hello? And after a minute or two she came back in to the bar looking even more upset then she had the first time. Two more? she said. Yes, please. As she poured the pints I tried making small talk. Bit quiet in here tonight, isn’t it? Not really, says she. It’ll pick up later. I looked at my watch. It was after nine. I wonder what she meant by later. Sure there couldn’t have been more than twenty eligible drinkers in town and none of them were here on a Friday evening at nine. If one more person came in the door, which seemed unlikely, it would be a goddamn party. We finished our pints and Mr. Lynch put a few bills on the bar, not wanting to disturb the proprietress and all, and we started walking back down the hill to Paddy Healy’s. It was a long walk and it was in the dark and there was no real shoulder to the narrow two-lane road so that I was nervous that if someone came over the hill too quickly and didn’t see us we’d be gonners. But I needn’t have worried. Although it took us a good half hour to get back to the farm, not a single car passed us on the road. Just to clarify, the lovely door in the photo isn’t the barren little bar we endured.